Click the title above to read the February issue of the NBEA newsletter. Strangles Case - Northumberland County, N.B. 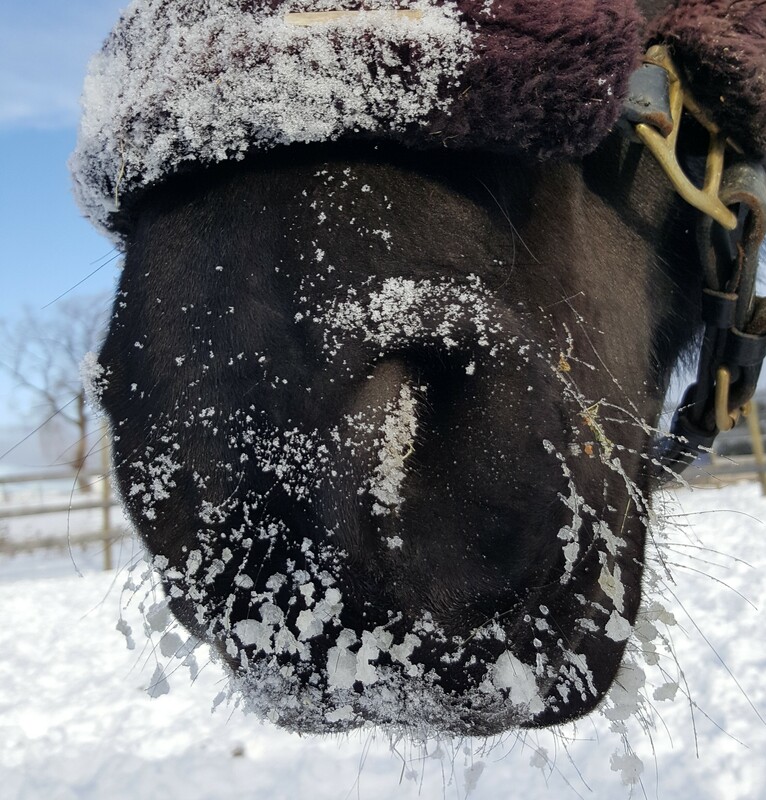 On January 14th, a provincial veterinarian was called out to a farm for a horse not eating and having a nasal discharge. Examination revealed a fever, swelling under the lower jaw leading to the suspicion of the presence of Strangles. A nasal swab was taken and on January 17th, Strep. equi equi (strangles) was cultured. The premise is under quarantine, restriction placed on animal and people movement. 2 other horses on the premise currently do not show signs and are being monitored. Infected horse is currently being treated. Click on the title above to see the January 2019 edition of the NBEA newsletter! Click here for pre-registration form. Click on the title above to see the November issue of the NBEA newsletter! Click on the title above to see the October issue of the NBEA newsletter! Click on the title above to see the September issue of the NBEA newsletter! Click on the title above to see the August issue of the NBEA newsletter! Click on the banner above to see the July issue of the NBEA newsletter! 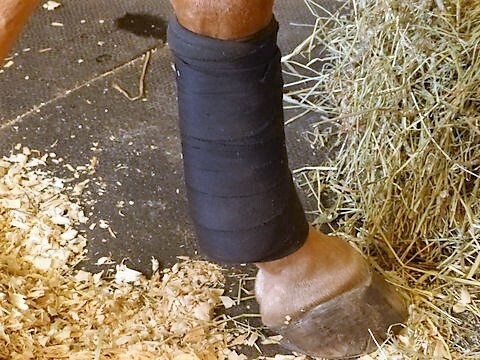 This 2-day course provides an introductory overview for horse owners, riders, trainers and coaches on the application and uses of kinesiology tape on their own horses. Participants will learn through presentation/discussion, demonstration, and hands-on practice. 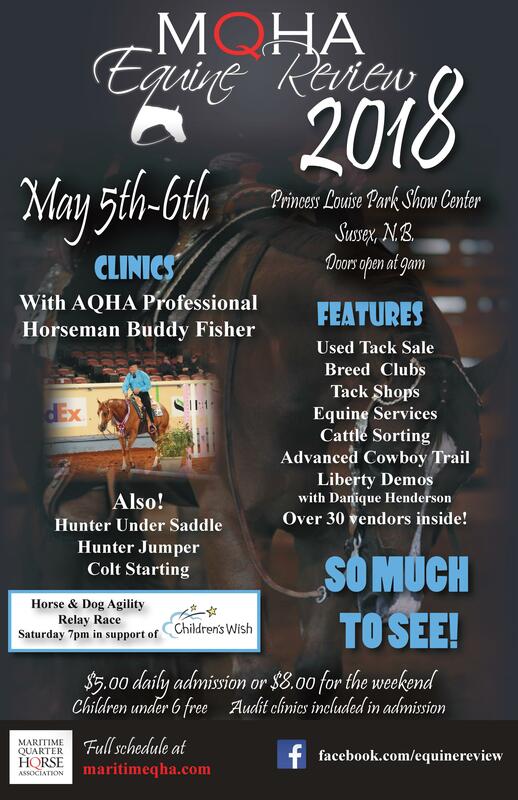 The instructor for this course is Christa Veinotte, International Equine Massage Therapist and Rehab Specialist. The course takes place September 29-30, 2018 in Truro, NS on the Dalhousie Agriculture Campus. The cost of the course is $560 + HST. Decision deadline is September 14th, 2018. Space is limited. For more information, please click on the course name above. This 12 week, ONLINE course, provides a one-on-one approach to help each student develop the necessary skills to train animals using positive reinforcement. This course offers a collaborative learning approach with students working through, lesson by lesson, at the same pace. As a student, you will be applying theory and scientific research to practice by documenting weekly progress through record keeping and videos. This course will help you become skilled at identifying wanted behaviours, goal setting, planning, training and understanding your animal. The instructor for this course is Melanie Smith. She is a Certified Professional Dog Trainer & Behaviour Consultant, has been training dogs since the age of nine. In 2012, Melanie graduated from Dalhousie University Faculty of Agriculture (then Nova Scotia Agricultural College) with a Bachelor of Science degree in Agriculture majoring in Animal Science. She is a Certified Canine Massage Therapist and a member of the International Association of Animal Massage Therapists. The cost for this course is $1447.75 + HST and runs from October 1- December 30th, 2018. Decision deadline is September 21, 2018. For more information, please click on the course name above. "We would like to invite you to participate in a research project titled “Understanding the experience and role of young athletes’ parents in doping prevention.” This research aims to examine young athletes’ parents’ perceptions of their role in doping prevention and to identify how they can appropriately help to spread WADA’s clean sport message to their children. We are conducting interviews in Canada to contribute to the wider project, led by Prof Mathieu Winand from Luxembourg, Lunex University. You are invited to provide an interview to express you views on these matters, which should take 40-60 minutes and may be conducted face-to-face or via phone." 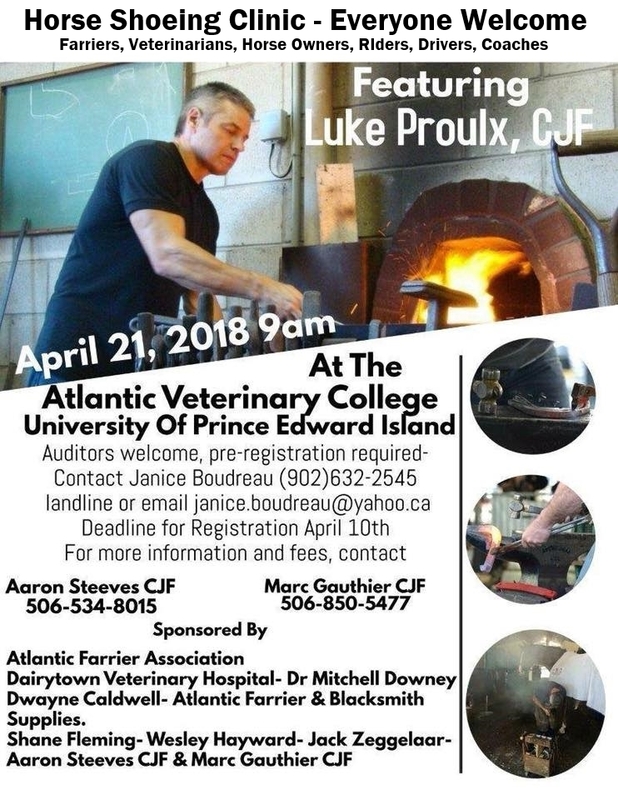 Terry Byers, PhD and Gabriela Tymowski-Gionet, Ph.D.
Shurgain, Vetoquinol and the Provincial Veterinary service‎ have joined together to bring information on biosecurity and answer any concerns people have about the recent strangles cases. The Irish Draught Horse Society of Canada will be holding inspections this fall. 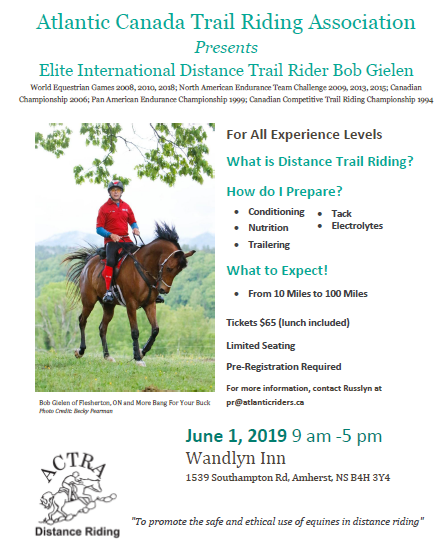 If you would like to have your Irish Draught Horse or Irish Draught Sport Horse inspected this year in Canada, please click here for more information. 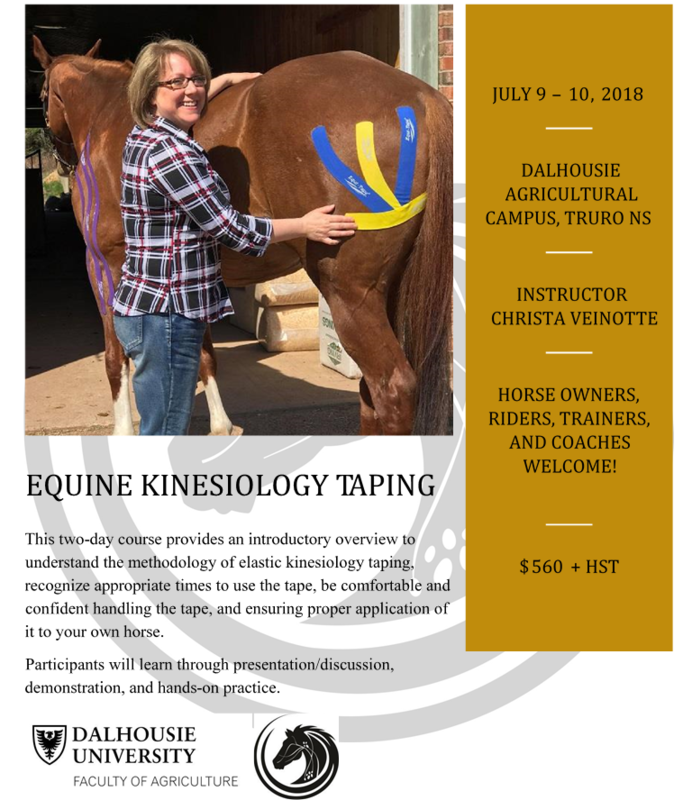 This 2-day course provides an introductory overview for horse owners, riders, trainers and coaches on the application and uses of kinesiology tape on their own horses. Participants will learn through presentation/discussion, demonstration, and hands-on practice. The instructor for this course is Christa Veinotte, International Equine Massage Therapist and Rehab Specialist. The course takes place July 9 and 10th in Truro, NS on the Dalhousie Agriculture Campus. The cost of the course is $560 + HST. Registration deadline is June 25. Space is limited. For more information, please click on the course name above. This 12 week, ONLINE course, provides a one-on-one approach to help each student develop the necessary skills to train animals using positive reinforcement. This course offers a collaborative learning approach with students working through, lesson by lesson, at the same pace. As a student, you will be applying theory and scientific research to practice by documenting weekly progress through record keeping and videos. This course will help you become skilled at identifying wanted behaviours, goal setting, planning, training and understanding your animal. The instructor for this course is Melanie Smith. She is a Certified Professional Dog Trainer & Behaviour Consultant, has been training dogs since the age of nine. In 2012, Melanie graduated from Dalhousie University Faculty of Agriculture (then Nova Scotia Agricultural College) with a Bachelor of Science degree in Agriculture majoring in Animal Science. She is a Certified Canine Massage Therapist and a member of the International Association of Animal Massage Therapists. The cost for this course is $1446.35 + HST and runs from June 18- September 16th. Registration deadline is June 11, 2018. For more information, please click on the course name above. 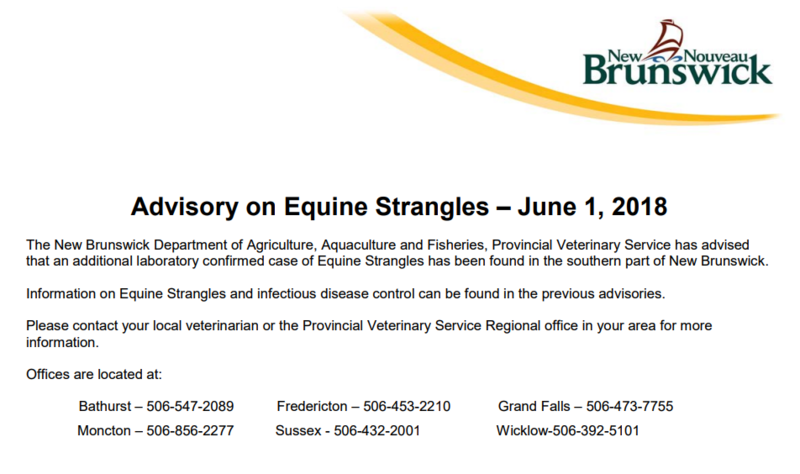 The New Brunswick Department of Agriculture, Aquaculture and Fisheries, Provincial Veterinary Service has confirmed a second case of Equine Strangles in the southern part of New Brunswick on May 28th, 2018. Equine Strangles is a bacterial infection that is highly contagious and causes horses to have a fever, cough, lethargy and reduced appetite. This second case is located at a different barn from the previously diagnosed case. A no-movement policy has been put in place at this second location which means that no horses can move on or off the property at this time. The policy will be held in place for at least a few weeks while the horses are being monitored. Temperature, nasal discharge, cough, appetite, jaw and throat latch swelling and overall behaviour of these horses are being monitored. Please call your local veterinarian if you have any concerns about your horse. A biosecurity plan, vaccinations and general health plan should be discussed. In a non-outbreak situation, preventative measures such as vaccination are available and may be appropriate. 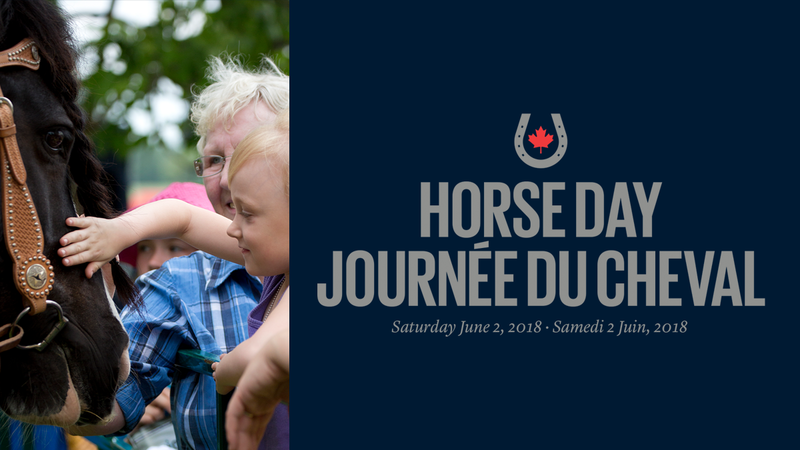 This second advisory is to provide an update to the equine industry of New Brunswick and to help reduce the spread and mitigate the risks of this contagious disease. The American Association of Equine Practitioners (AAEP) has guidelines on infectious diseases such as Strangles and its control at https://aaep.org/news/updated-biosecurity-guidelines-available-aaep-website (“Updated Biosecurity Guidelines available on AAEP Website”). The Equine Disease Communication Center (EDCC) at www.equinediseasecc.org provides information on disease and biosecurity. The Université de Montréal veterinary medicine school has information at http://chuv.umontreal.ca/le-chuv/hopital-equin/ressources-hopital-equin/articles-equins/gourme-chez-chevaux-questions-reponses/ about Strangles. Please contact your local veterinarian or the Provincial Veterinary Service Regional office in your area for more information. 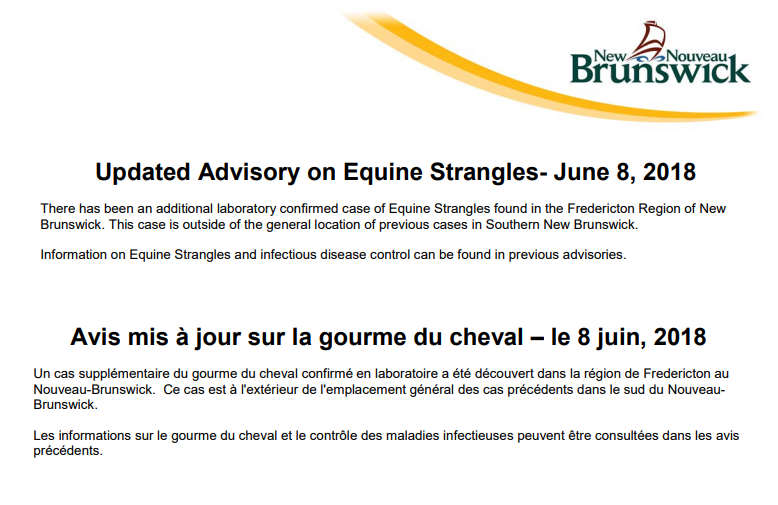 The New Brunswick Department of Agriculture, Provincial Veterinary Service has confirmed that a diagnosis of Equine Strangles has been made in the southern part of New Brunswick, on May 18th. Equine Strangles is a bacterial infection that is highly contagious and causes horses to have a fever, cough, lethargy and reduced appetite. A nasal discharge turning very thick and pus-like will develop and abscesses can occur under the lower jaw and throatlatch, making it uncomfortable for the affected animal to chew and swallow. 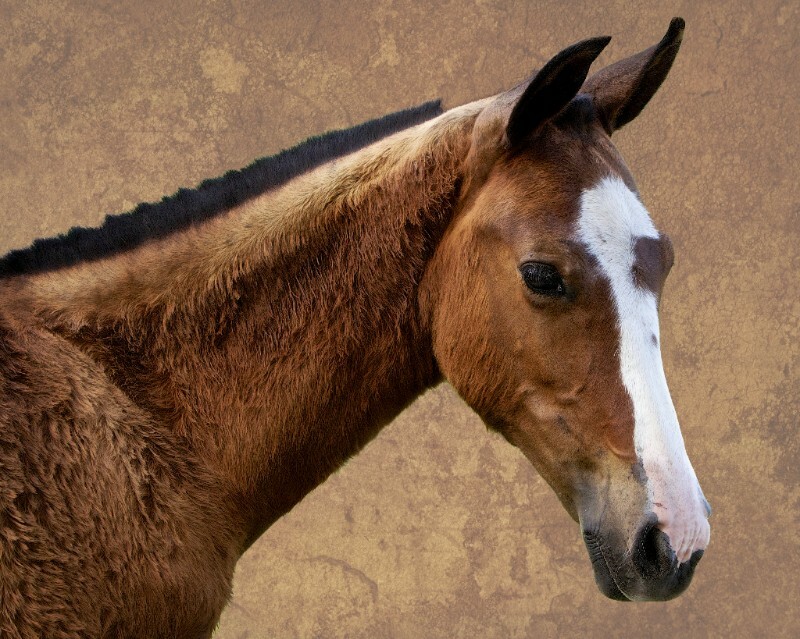 A horse may develop clinical signs of disease between three to 14 days after exposure. A small percentage of horses may develop more serious complications, but most will recover in three to four weeks. Barns that experience the disease should impose a no-movement policy (in or out of the barn), monitor animals closely, restrict visitors and prohibit new animals from entering the premises. If you have any concerns, please contact your veterinarian who can provide you with treatment plans and management strategies. Vaccines are not useful to prevent the spread of the disease on farms experiencing outbreaks. In a non-outbreak situation, preventative measures such as vaccination is available and may be appropriate. This vaccine, along with other vaccines and general health care can be discussed with your local veterinarian. 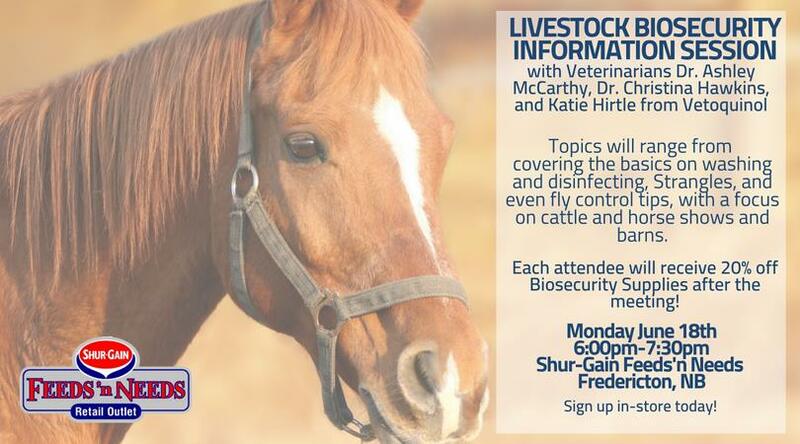 The Equine Disease Communication Center (EDCC) at www.equinediseasecc.org will give disease information and discuss biosecurity. National Horse Day is June 2nd, 2018. Click for more details and ideas for hosting an event. Both EC and the NBEA are offering prizes! 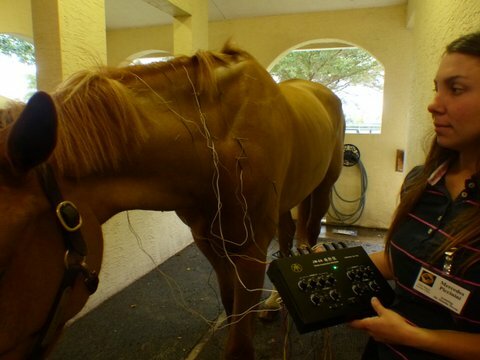 A special edition of the NBEA Newsletter dedicated to your horse's health. Click on the title above. 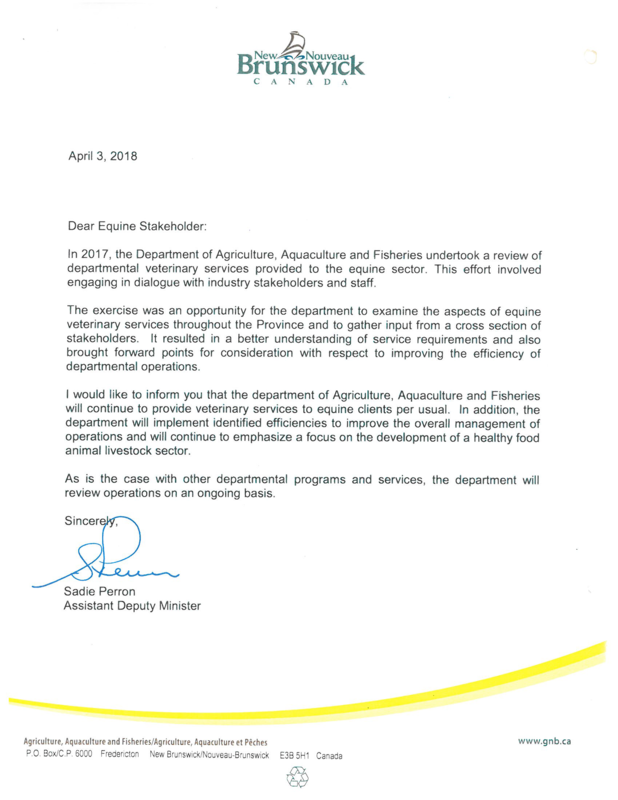 The New Brunswick Department of Agriculture, Aquaculture, and Fisheries has released a statement regarding its intentions with veterinary services to horse owners. Click here to read the brief statement. Are you a resident of York County, headed to an agricultural or veterinary college or university this year? You may be eligible for the Frank Fraser Joslin and Blanche I. (Hood) Joslin Scholarship, with a minimum value of $6000. Click here for more details and an application form. Deadline to apply is May 1st. Auditing fee is $20.00. Lunch will be provided. All interested persons are welcome to attend this unique learning opportunity. Learn more about clinician Luke Proulx - Click here. Click on the title above to link to the NBEA's newsletter for March. There's a lot to see! Open to those who want to develop as a Driving Official or those who want to understand the discipline of Combined Driving. The focus of the clinic will be understanding the rules the discipline is based on. Podium Performance Series in Moncton, join us on WEDNESDAY, MARCH 21st @ 6:30PM. A unique and engaging dynamic session that you do not want to miss! Creating a mentorship environment; the succession line. “Mentorship is a relationship in which advice, information, guidance, support, or opportunity are offered for professional development.” There are two different types of mentorship; formal and informal. Join our panelists; Neale Gillespie, Monette Boudreau-Carroll, and Lauren Hale-Miller. About our panelists: Neale Gillespie; Senior Consultant with the Coaching Association of Canada and all around Guru of Leadership Coaching advice. Monette Boudreau-Carroll is the Head Coach of Women’s Volleyball @ U de M and also the Head Coach for the 2017 Canada Summer Games Women’s Volleyball team. Lauren-Hale Miller is the Head Coach of the UNBSJ Women’s Volleyball team and was the Women in Coaching Apprentice for the 2017 Canada Summer Games Women’s Volleyball team. As of December 1, 2018, Health Canada is making changes to the dispensing of all Medically Important Antimicrobials (MIAs). From that date onward, products containing antibiotics will require a prescription from a veterinarian, and can only be dispensed by a veterinarian, or licensed pharmacist. Health Canada is making these changes to aid in protecting human health by reducing the factors to the nationwide incidents of drug resistant organisms. How does this affect horse owners and animal welfare? Horse owners may have been in the habit of obtaining products containing antibiotics at feed stores or tack shops, rather than through their veterinarian. They may also have imported products containing antibiotics for their own use from the US, or from online pharmacies in the past. These options will no longer be available. Those without a veterinarian, with whom they have a valid veterinary-client-patient-relationship, will not be able to access products that contain antibiotics without a prescription. Horse owners in remote areas may have greater difficulty obtaining products containing antibiotics. 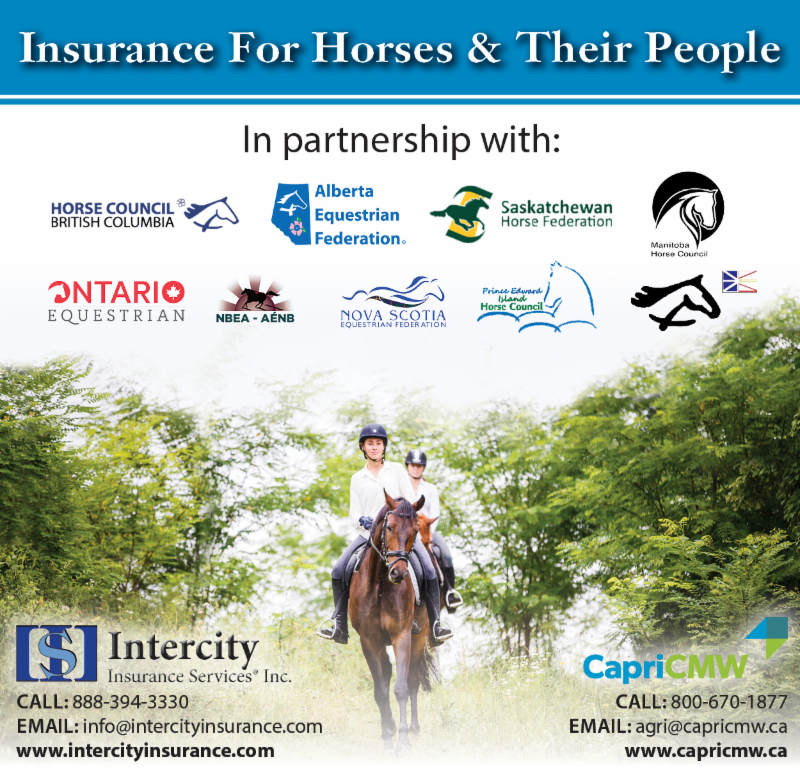 ♦ Read more here, including links to Health Canada's guidelines for horse owners. Introducing the 2018 UNB Sports Business Conference, an innovative initiative that is truly the first of its kind in Atlantic Canada! This weekend conference has the potential to help propel the industry in New Brunswick forward... be part of the conversation! The theme of the conference is Be A Game Changer and focuses on innovation and forward-thinking. The vision behind the UNB Sports Business Conference is to inspire delegates to continue to make a significant difference in the industry. The conference will welcome 25+ captivating speakers and 150+ delegates from across the country to engage in a proactive conversation that will help propel the industry forward. From incredible professional development and networking opportunities to hearing 4 speakers talk about their 2018 Pyeongchang Olympic/Paralympic experience, this is an event never seen before in Atlantic Canada! Click here for more details, list of speakers, and link to register. 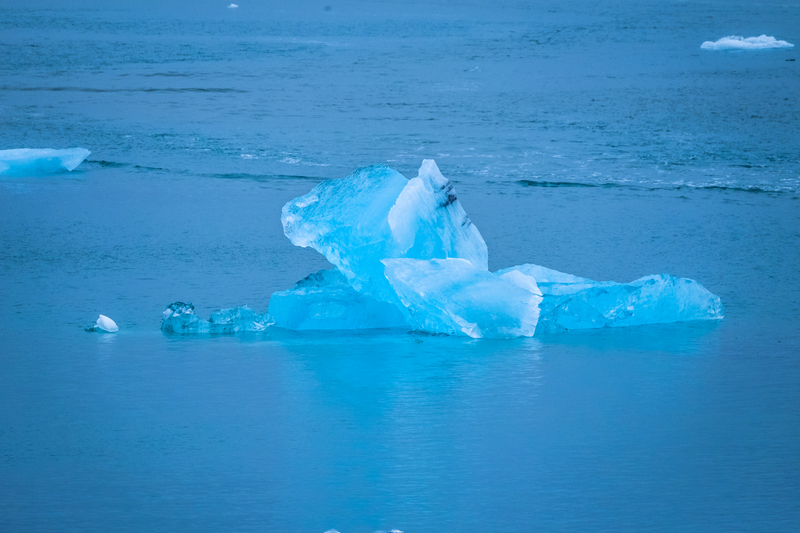 As New Brunswickers, we are all too familiar with the damaging potential of snow melt run-off, ice jams in our streams and rivers, flash floods during a mid-winter rain storm, and spring freshet flooding. As a horse owner, are you prepared for flooding at your stable? It can happen nearly anywhere. and check your emergency preparedness for flooding. Keep an eye on the local situation with the NB River Watch website. 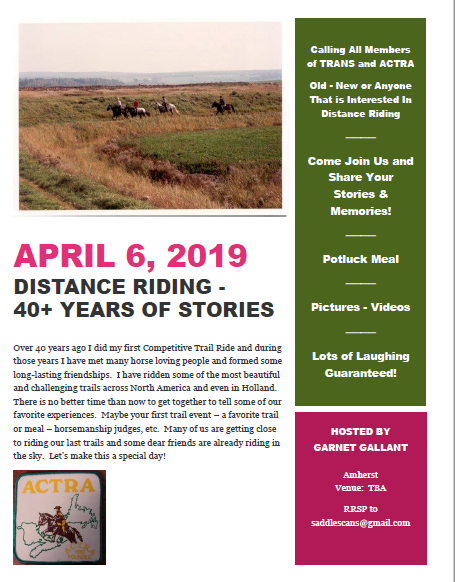 Click the title above to see the entire NBEA February newsletter. So much is going on! The initial equine Code survey results showed need for a follow-up survey to further assess respondent’s compliance with the Requirements in the Code. The follow-up survey ran from 27 NOV 2017 to 20 DEC 2017. Attached is the summary report for the follow-up survey. The survey was sent to 207 people from the initial survey who indicated they were aware of the Equine Code and interested and willing to participate and provide further detail. 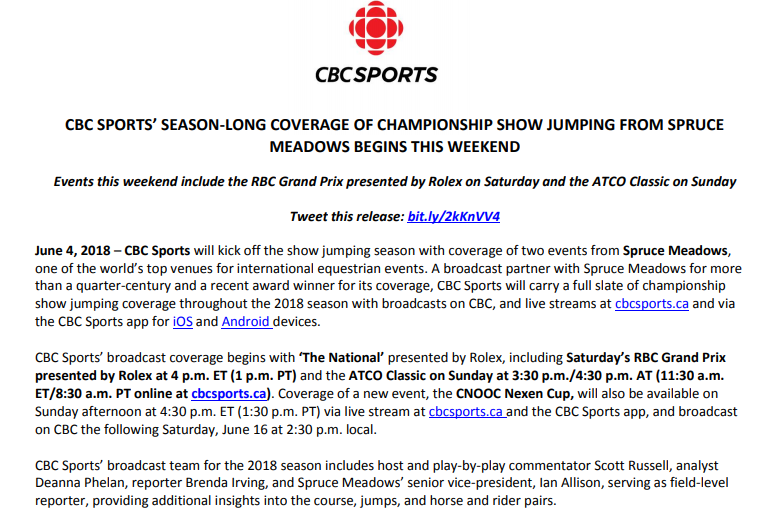 $150,000.00 Will Be Distributed To Under 25 Show Jumping Athletes Across Canada! under the age of 25. The programs are being designed to help identify those who have the potential in becoming Canada’s next High-Performance Athletes. Canada Gaining New FEI Event at Foshay in New Brunswick in 2018! 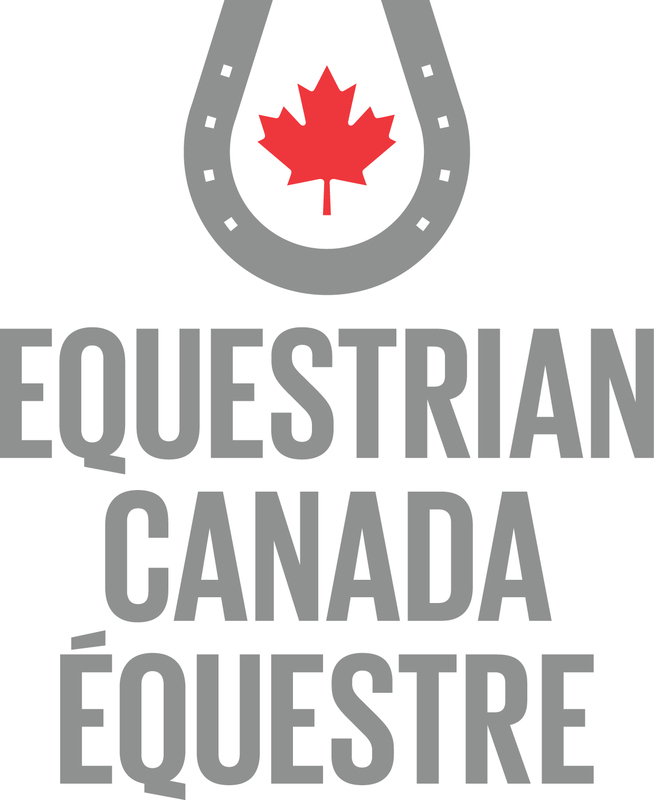 Ottawa, ON, July 21, 2017 – Equestrian Canada (EC) is pleased to introduce Long-Term Equestrian Development (LTED) 2.0 — a resource to benefit all equestrian participants, from athletes and parents to coaches and officials to competition organizers and owners. The EDCC (Equine Disease Communication Centre) has info on the EIA outbreaks, while it has info for North America, the CFIA is also using the system. You can sign up on the site to receive ongoing info as it becomes available. 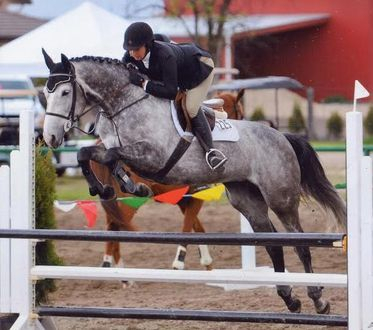 Four teams of equestrian athletes, under the auspices of the New Brunswick Equestrian Association (NBEA), will be participating in the second annual Atlantic Canada Equestrian (ACE) Championships later this show season. 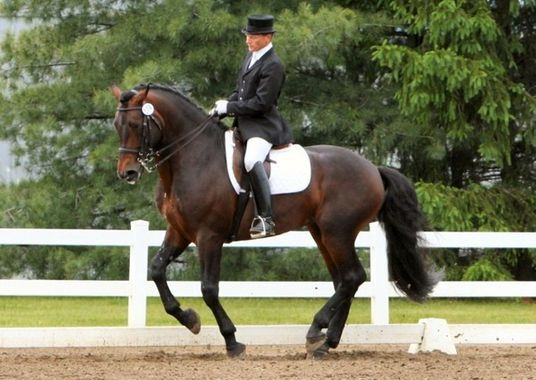 Horses and riders who qualify for the teams will represent the Province in the competitive disciplines of Dressage, Eventing, Jumping and Reining. Watch for 2018 LTED/ACE Championships details here soon!